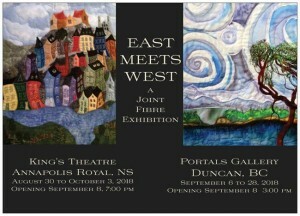 If you have not had a chance to visit the East meets West exhibit at the King’s theatre lobby in Annapolis Royal, you still have time. The exhibit will now remain up until Saturday, November 3rd. The 30 or more 10 by 10 inch pieces of different fibre techniques are wonderful to look at and we are thrilled to have had this joint exhibit with VISDA (Vancouver Island Surface Design Association).